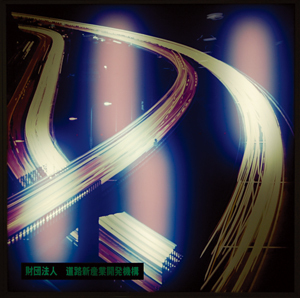 In this issue we'd like to introduce Highway Industry Development Organization (HIDO). HIDO conducts survey, research, development and fostering of new road-related industries by coordinating industry-academia-government partnership. In October last year, "Smartway 2007 Demo" was held as a part of various ITS (Intelligent Transport Systems) -related projects promoted by Ministry of Land, Infrastructure and Transport (MLIT). We focus on the executive office for this event organized with the members of ITS Research & Management Division and Project Promotions Department IN HIDO. 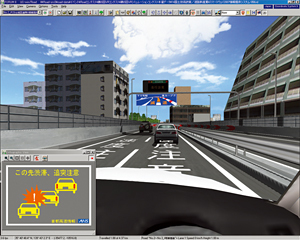 At "Smartway 2007 Demo," "On-board ITS Experience" program was provided in which participants were able to experience various state-of-the-art ITS services first on the Metropolitan Expressway. Along with this, a drive simulator (DS) was installed at the exhibition area with the aim of having more people experience this realistically. 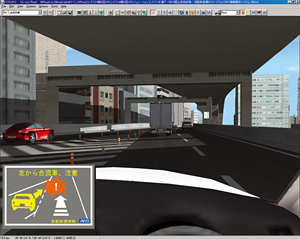 As a tool to realize this idea, Forum8's 3D-Realtime VR (Virtual Reality) software "UC-win/Road" and "UC-win/Road Drive Simulator" that represents driving scenes with the ambience of real highways using a real four-wheel vehicle gained attention. Taking charge of Smartway-related projects in HIDO and being involved with adapting these products as an effective way of exhibiting in the event, Mr. Takashi Urano, Deputy Director, Planning & Development Department and ITS Research & Management Division; Mr. Osamu Iwami, Senior Assistant Manager, ITS Research & Management Division; Mr. Kazunori Iwasaki, then Senior Assistant Manager, Project Promotions Department; Mr. Kenji Takahashi, Researcher, Project Promotions Department told the story. HIDO was founded in 1984, aiming at contributing to road developments and extensions, which in turn stimulate the national economy and quality of life. Its business ranges from research and development of new technologies that lead national highway policies to practical application as a social system by combining extensive element technologies. Moreover, "new road-associated industries," which are objects of HIDO's projects, covers a wide range of areas. Therefore, it is characterized by an organization in which experts in various fields including civil engineering, electrical machinery, and information communication work in cooperation. In the structure of HIDO, Board of Directors decides upon important subjects concerning the management of business. There are five departments under it that deal with practical business. Board of Councilors and Research Deliberation committee deliberates on their organizations and activities, and Supporting Members consist of a large number of companies. In this structure, four departments, namely, Research Department, Planning & Development Department, ITS Research & Management Division, and Project Promotions Department actually take up research, study, and development. Work contents of each of them can be roughly classified as independent study such as investigation of system design for Research Department, intangible investigation such as development of element technologies and their deployment measures for Planning & Development Department, study into introduction of ITS technologies for ITS Research & Management Division, and project planning as a social system by combining various element technologies for Project Promotions Department, according to Mr. Takashi Urano. Besides, many of the consignment works that HIDO conducts are from MLIT, except for those from some local public bodies. For example, recent subjects for investigation include advanced computerization related with regional ITS, highway management with IT (information technology), and integrated information providing system etc for Planning & Development Department; Smart IC (Interchange), regional ITS, and International standardization for ITS Research & Management Division. Also, Project Promotions Department, which was established by succeeding part of the work of the above Department and Division in April 2006, has been tackling with "Smartway 2007 Demo" on which we focus, as well as Scenic Byway Japan, restoration plan of the Nihon Bridge, and ETC for motorcycles. Making free use of advanced IT, "ITS" form a network over people, roads, and vehicles in order to solve manifold problems in road transport. As "Smartway" is a platform for actualizing the effect of ITS and realizing diverse services, it is positioned as the next-generation road that has integrated leading-edge ITS technologies. Concerning ITS, it was mentioned as a key to create safe and secure society in the Government's long-term strategic guideline "Innovation 25," decided by the Cabinet in June 2007, considering the period up to 2025. Also, IT Strategic Headquarters developed "New IT Reform Strategy" (2006) to implement national reform by means of IT by 2010. The strategy puts "Achieving the goals of the world's safest roads and annual road accident fatalities of less than 5,000" as one of the key IT policy. Priority Policy Program 2007, announced in July 2007, expresses concrete measures to be taken by the relevant authorities to ensure achievement of these goals. 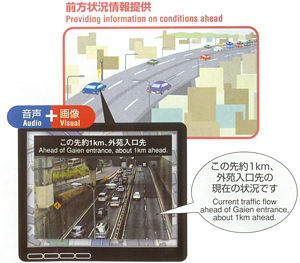 Among them, Mr. Kazunori Iwasaki states that the measures of MLIT correspond to the implementation of Smartway, including assisting safe driving through road-vehicle cooperation, such as "system for providing information on obstacles ahead" and "system for providing information on conditions ahead", both of which are symbolized by Advanced Cruise-Assist Highway Systems (AHS). In 2004, Smartway Project Advisory Committee held by MLIT offered proposal on "ITS Enter the Second Stage", which shows the idea that ITS has been undergoing steps where individual state-of-the-art services can improve users' convenience, and that with those services having taken root, ITS have reached the second phase of bringing about social effect, followed by further steps to realize "smart mobility for all," where ITS helps to reform society. According to this proposal, MLIT is promoting concrete discussions and measures. The Project Advisory Committee has also been active with strengthened government-private sector collaboration, including establishment of working groups (2004). Outline of "Smartway 2007 Demo"
In such a current, MLIT conducted joint researches with 23 private companies for about 1 year starting from February 2005. Various Next-generation road services to be provided through a single ITS on-board unit were developed, which were verified to be effective at "The Smartway Open trial Demo 2006," held in February 2006 on a test course at the National Institute for Land and Infrastructure Management. The result of the joint research was succeeded to the Advanced highway system (ITR) section of the Smartway Partner Council that consists mainly of private companies and organizations for further discussion. The outcome was submitted to Japan Electronics and Information Technology Industries Association (JEITA) as a technical material, contributing to standardization and specification of ITS on-board units. Using new on-board units procured according to this specification, MLIT started on-road tests on Route No.4 Shinjuku Line, Route No.5, and Inner Circular Route of the Metropolitan Expressway in May 2007. The objective of these tests is practical application of new ITS services that contribute to safe driving assistance through visual and audio information by connecting roads and vehicles through telecommunication, following VICS (Vehicle Information and Communication system) or ETC. 30 private companies including manufacturers of automobiles and electronic devices participated in the on-road tests. The on-board units were lent to these companies for actual driving. Based on their evaluation, additional improvements were made to the services to be provided. Next, MLIT held "Smartway 2007 Demo" in October 2007 at Tokyo International Forum for the purpose of widely publicizing state-of-the-art ITS services that reflect the result of the tests. Symposiums and exhibition were held there in addition to "On-board ITS Experience" program of actual driving demonstration cars equipped with ITS on-board units on the Metropolitan Expressway. As the office staff of the event, Mr. Osamu Iwami took charge of exhibition, and Mr. Kenji Takahashi of On-board ITS Experience etc. However, it is inevitable that there are some restrictions in terms of efficiency on "On-board ITS Experience" conducted on the public highway, compared with experiments on the test courses. Consequently, in order to compensate this, an attempt was made for the first time in this event to reproduce ITS services by 3-D VR and link them with DS so that participants could experience the bodily sensation of driving on Smartway. "As I had known about UC-win/Road, I asked a Forum8 person in charge if it would be possible to represent driving scenes by CG." Hearing that DS was released at that time, Mr. Kenji Takahashi proposed to the WG members who consider the event contents that he wanted to rent and use DS during the event period so that visitors could get a real feeling while manipulating. After the proposal was approved, they started to create concrete VR data in around May, as Mr. Takahashi recalls. One of the challenges in the process was to clearly show the display of a navigation screen that is linked together with the driving screen. This was overcome by setting up each of them as an independent screen. Also, the greatest pain and effort was made in subtle adjustment, for example, as to the change in timing to show information about obstacles or conditions ahead on the navigation screen according to the way a DS operator steps on the accelerator, or how to create congestion beyond a curve timely. On the other hand, it was required to limit the program to finish within about 3 minutes in order to let as many people as possible experience it. Methods were elaborated to incorporate various elements as much as possible. This DS corner with 3D VR was very popular throughout the event, and MLIT, the organizer, and participant companies showed their requests to use the system in the following events and so on. After the event was over, ITS on-board units and roadside units were modified along with reorganization of specification based on things like the comments drawn together by that time. After January 2008, roadside units (the Metropolitan Expressway) are expected to practically start information provision services. Concerning ITS on-board units, on the other hand, products that match the specification provided by JEITA are expected to come onto the market after spring next year. 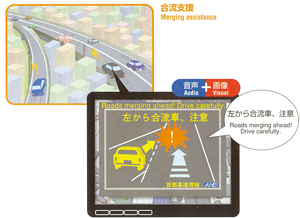 Inform drivers of any merging vehicle with voice guidance and illustration prior to the merging section. Alert drivers by voice guidance and illustration according to driving speed from built in digital map information of a car navigation system. Alert drivers of existing vehicles in the driver’s blind spot or traffic jam by voice guidance and illustration. 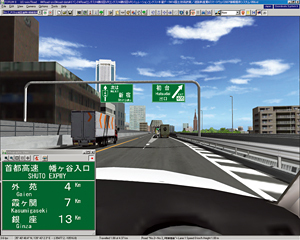 Inform drivers of simple road sign information as well as locational information of ramp. 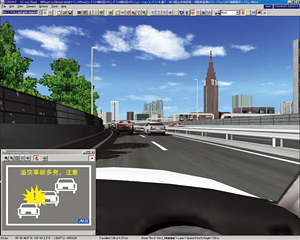 MLIT has been holding events to open the on-road tests and their results to the public at multiple bases with Tokyo as the start (October 2007). On the other hand, "New IT Reform Strategy" puts that a large-scale proving test with relevant authorities involved will be conducted in 2008 fiscal year. The base of ITS is growing wider steadily towards full operation in and from 2010 fiscal year. The basis of function that enables services such as car navigation systems, VICS, and ETC to be provided by a single on-board unit is ITS technologies such as DSRC (Dedicated Short Range Communication). 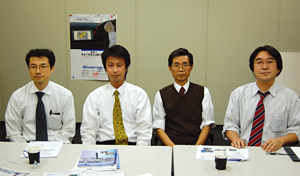 Mr. Takashi Urano expects these technologies to be utilized in various road-related business fields. From this point of view, as areas where ITS technologies will be put to active use and thereby draw attention, he mentions as follows: measures to cope with congestion and environment by establishing Smart IC in urban areas, special permission vehicle monitoring system using DSRC, various information provision services that utilize road-vehicle communication with which large amount of data can be transmitted, road management or evacuation guidance aligned with terrestrial digital broadcasting, supporting public transport function with bus location system, virtual parking, and so on. "What is important is how to use technology, to say nothing of the technology itself. In other words, it is how to tie to the next generation by using it. I think an approach will be required, for example, to set up goals and objectives of urban planning and town development, with ITS positioned as a means of achieving them." We are most grateful to everyone involved for spending time with us for this interview.